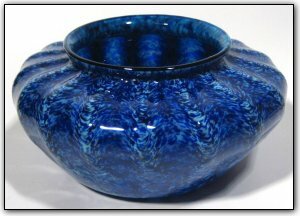 This unique "low bowl" features shades of blue on the outside with aquamarine on the inside. This bowl also features scallops, which is a difficult and complex technique which uses an optic mold during the glass blowing process. Make sure to zoom in to see the 3D effect of the scallops and to truly appreciate the beauty of this bowl.